Designer Charoonkit Thahong knows that the foundation for a great interior is great architecture. So he spent months searching for just the right raw, industrial space to remodel for his own home. This loft in a converted school building fit the bill: open space, hardwood floors and plenty of sunlight. "It was almost as raw as I expected," Thahong says. "It was actually livable, but it just wasn't my taste." In seven months Thahong transformed the apartment, in Manhattan's Midtown West neighborhood, into an eclectic showcase for his individual style. Collections of ceramics, tropical plants, midcentury alarm clocks and other quirky knickknacks occupy almost every surface, but the space still manages to feel clean and modern. Thahong's loft is part of a former school building, called The Glass Farmhouse, that was converted into residential apartments in 1982. The 13-story building has 52 sun-filled loft-style apartments, occupied mostly by photographers and artists. Thahong has loved tropical plants since he was very young, and was excited that his sunny loft would suit his indoor tropical garden. "I definitely have a green thumb," he says. 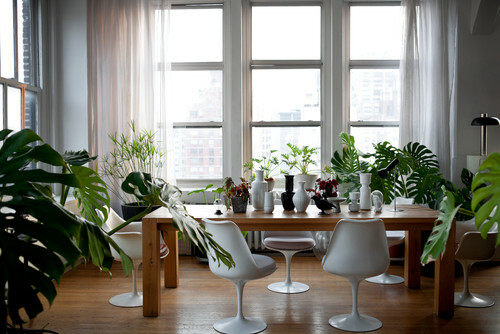 "The loft makes it easy for my split-leaf philodendron to grow very big." Most of Thahong's decor consists of vintage pieces and classics in a neutral palette. "I'm a neutral guy when it comes to color," he says. "But I really like more black, white and gray than beige." Black leather contrasts with soft whites and natural wood tones in the living room. The love seat is a vintage Victorian frame from eBay that Thahong painted black and reupholstered with black hide. The ceiling lamp in the living room started as an iconic Lyndon outdoor floor lamp by designer Vico Magistretti, but Thahong had it adjusted and rewired for a statement-making ceiling fixture. Thahong's background in product design and ceramics has fostered a deep love for simple white vases. Most of his collection hails from Germany, particularly from Rosenthal and the Royal Porcelain Factory in Berlin. 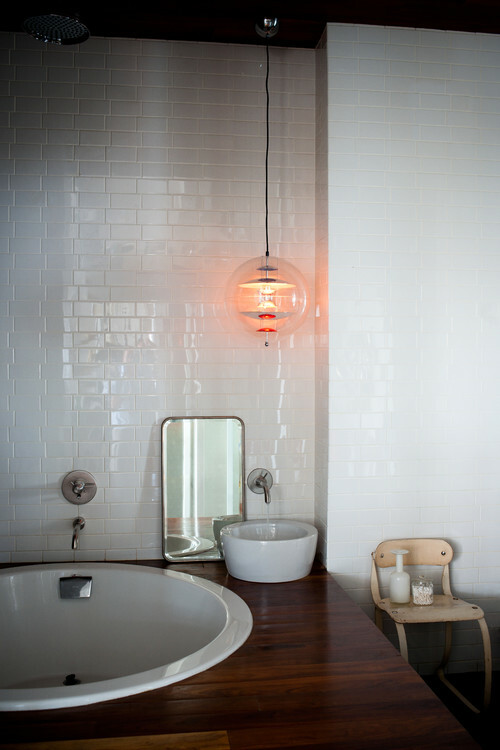 He also loves the Danish Holmegaard Gulvase in white, red and amber glass. 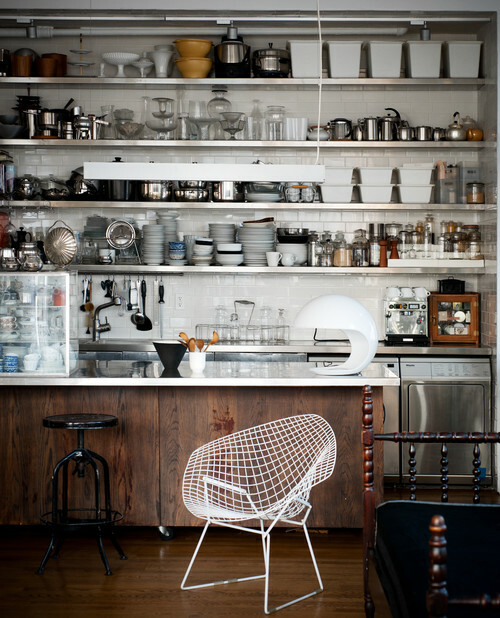 "I like the concept of 'simple is best,'" says Thahong of the vase's classic shape. Thahong sleeps in a lofted bedroom located atop a small closet. A classic Vitra wall organizer keeps must-have items on hand near the door. 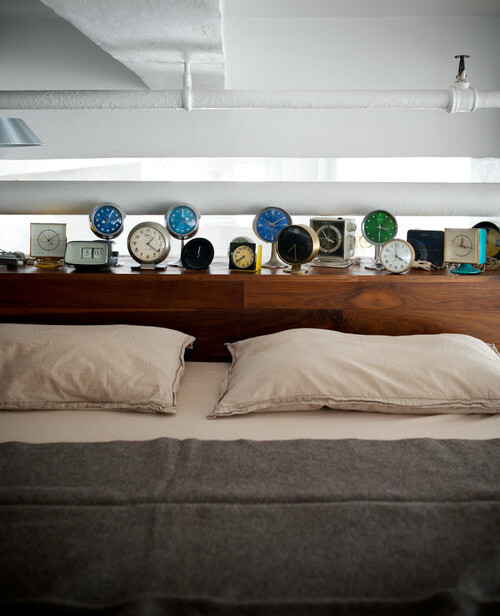 The lofted sleeping space has room for little more than a cozy bed, but Thahong still managed to sneak his collection of 1960s and '70s alarm clocks onto the half wall behind his bed. Although the original kitchen was dark and dated, Thahong lucked out with Viking appliances left over from the previous owner. 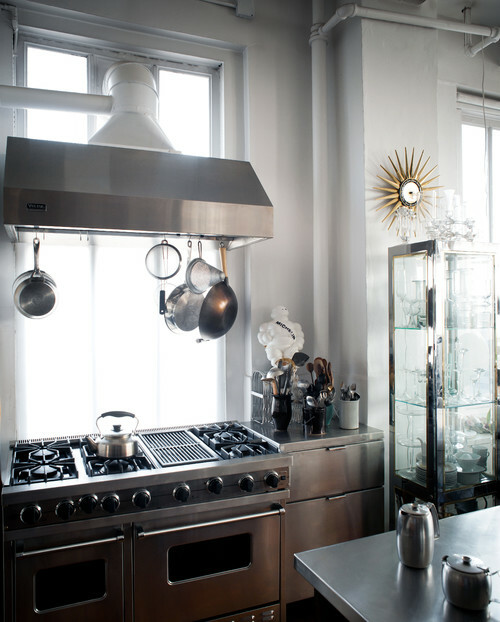 The restaurant-quality range hood was already in place when Thahong bought the space. Unlike many city kitchen hoods, this one vents out the window. "It's almost impossible to get a permit now to do that in a New York apartment," says Thahong. Thahong took advantage of the ventilation setup and installed a small washer and dryer underneath the kitchen countertops. The washer hooks up to the kitchen's plumbing, and the dryer hooks up to the range hood's ventilation. The stainless steel and walnut-stained plywood island was preexisting, but Thahong had a custom stainless steel top made for the back counter out of a single piece of steel with integrated sinks. Open industrial shelving extends all the way to the top of the wall, helping Thahong get maximum storage out of limited square footage. He keeps a ladder and step stool on hand for when he has to reach the party platters and other little-used items up top. The bathroom sits toward the front of the apartment, away from the windows on the other side of the unit. To keep the space from feeling like a cave, Thahong opened it up with a large, clear sliding glass door supplemented with a curtain for privacy. On the side of the bathroom shown here, floor-to-ceiling subway tiles cover the wall behind a 60-inch round bathtub. The vessel sink's location was determined by plumbing lines; Thahong usually sits cross-legged on the plywood tub deck when using it. "The bathroom is a really important part of all my designs," he says. "I like it to surprise and have an exotic feeling."